With a bit of an delay here’s the follow up post to First Week of ENYO. This time we look at the first month after launch to see how the Free with Ads model is holding up so far and if it’s possible to earn a bit of money with significantly less new downloads each day. 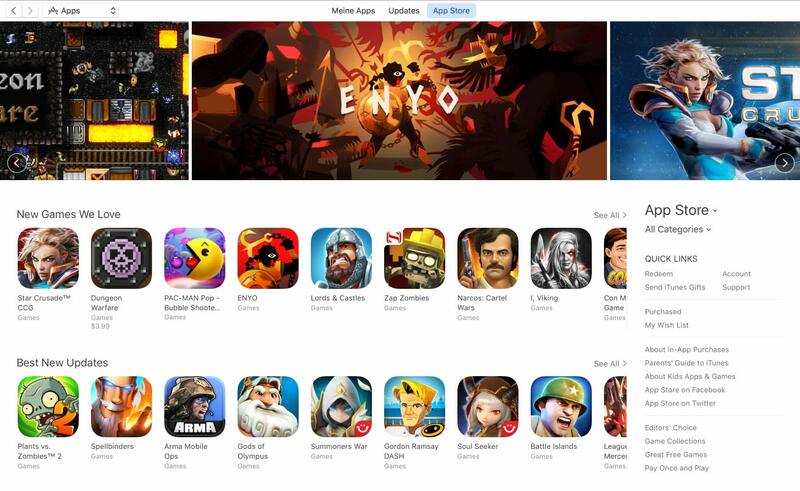 As posted ENYO was featured quite big world wide on the iOS Store with an amazing best new games #5 spot, which helped to drive massive amounts of downloads in the first week. On iOS alone we reached about 178.000 downloads. Google Play where we got a smaller featuring we still made 25.000 downloads which sums up to a meaty 203.000 downloads in the first week across both platforms. In total we’ve made about $6488 of revenue in ENYO’s first week coming from the video Ads and the one time iAp to remove the ads and unlock the daily mode. ENYO’s second week was blessed with another featuring on the App Store where we got a big banner in the strategy games section which helped to keep the momentum quite a bit. On the second week we’ve got another 77.000 downloads on iOS and 2800 on Google Play. Which sums up to almost 80.000 downloads on the second week. You can see from the graph that the downloads dramatically decreased in comparison to week one which was expected. 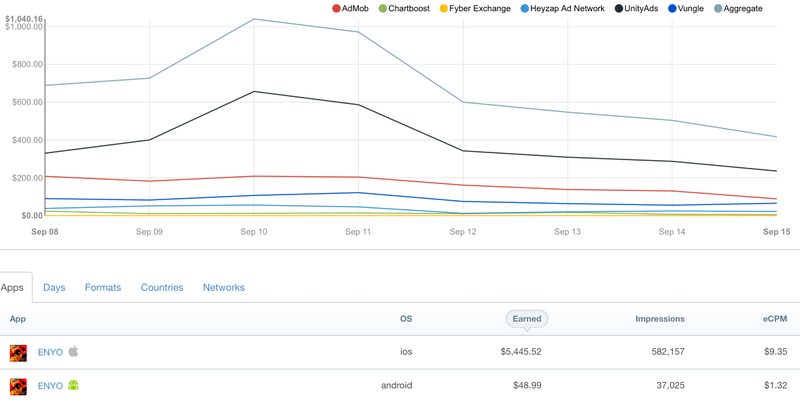 Revenue wise we made about $1300 through iAps. In comparison to that we earned about $5488 from ads. As you can see we actually made more revenue in total in the second week which was quite nice. Here’s the graph for our ads. In the first month we released 2 updates to address a few nasty bugs and we improved the UI interaction quite a bit. In addition to that we redid the tutorial to be more friendly to people who haven’t played a roguelike before. We also added a small help section that gives some infos on how the enemy types work. All in all we got quite good responses from a lot of people really enjoying the gameplay even tho it can be frustrating to lose at times. In total we reached about 274.000 downloads, 245.000 from iOS and 29.000 from Google Play. 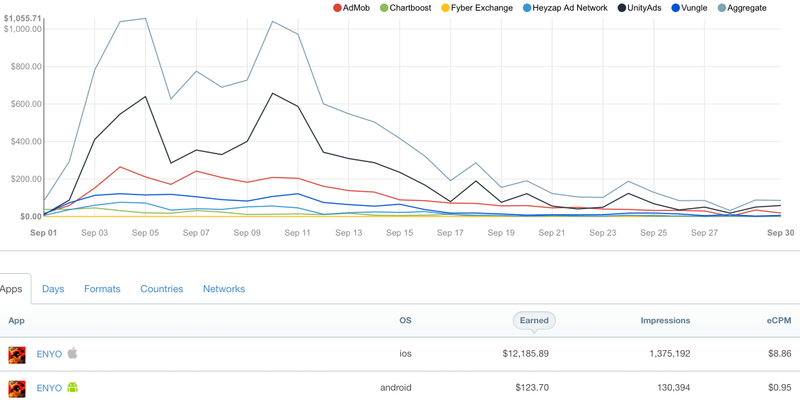 Most of the downloads were coming from the the first two weeks, after that downloads dropped significantly. Revenue wise we generated a total of $3500 from the iAp that unlocks the game and removes ads. After a month we earned a total of $12300 from our Ads shown in the game. This sums of to a grand total of $15800 that ENYO was able to make in it’s first month. Reviews on both platforms are pretty much the same. On iOS we have a 3.8 stars rating from 194 reviews while Google Play has a 3.9 stars rating from 198 reviews. As it seems the game is pretty much a hate it or love it one. We saw that a lot of good reviews were coming in later since a lot of the early free downloads attracted people that are not necessarily into this type of game. Once again we think ENYO was a successful project so far. With a really small development time of about 3 month in total we made about $15000 in the first month after release. It seems that Ads are ok when you have a moderately good influx of new users. Once your DAU drops below 30.000 it’s hard to generate a good amount of money from them though. This time, similar to Card Crawl, a featuring from Apple made the game worth while for us. I can not state enough how important platformholder support is these days for small devs like us. Making mobile games is as tough as never before.